Jep-Apart-Hotel, Prague discount hotels and accommodation. The historical builging is located in the heart of beautiful Prague only blocks away from all the main tourist and business attractions including Wenceslav Square muzeum and Charles Bridge, Old Town. There is no need to take a taxi or even the metro as everything is a convenient walking distance from the hotel. View photos, room descriptions and make online reservations at Jep-Apart-Hotel. 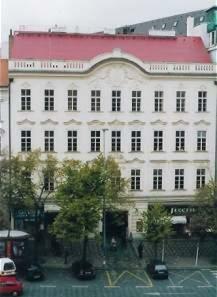 Save on room prices at Jep-Apart-Hotel, Prague.